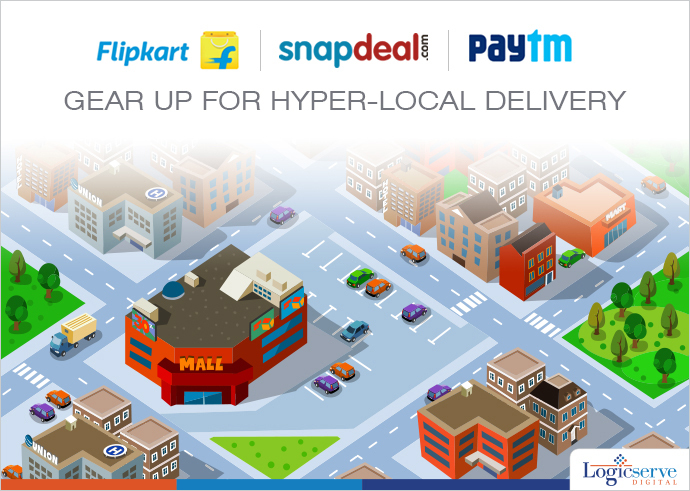 Top ecommerce firms – Flipkart, Paytm and Snapdeal are gearing up to enter into hyper-local delivery. For this they consider investing into hyper-local delivery start-ups that have huge potential to get a crowded business, though in a nascent stage. These hyper-local start-ups can deliver products quickly within few hours, by connecting customers with restaurants and supermarkets through apps. Flipkart is testing ‘Nearby’ an ordering app in Bengaluru, to deliver electronics, groceries, clothes, etc. according to the people familiar with the affair. The company is working on hyperlocal delivery push for at least a year now and would see it launch in the next two months. Snapdeal will expand into hyperlocal through financial investments and acquisitions. On the other hand Paytm have plans to leverage its mobile wallet for hyperlocal offerings, similar to what Alibaba Group does through its Alipay mobile wallet app. Paytm Payment Bank Ltd. is the new arm Paytm is creating to separate payments business from ecommerce. Considering the huge potential hyper-local delivery start-ups have gained, the ecommerce companies do not wish to miss this opportunity. This new trend is gaining importance due to the vast potential these small startups have to pose huge threat to the ecommerce giants businesses. So, ecommerce players find this the right time to join the forces to complement their own offerings. Weekend Digital Media Round-up: Google’s #SmallThanks Hub, Facebook’s VR experiences, Twitter’s Bookmarks feature and more..